Minichamps 1:43 resin model of the #36 Sauber C37 as driven by Antonio Giovinazzi in the 2018 Abu Dhabi Test. Minichamps 1:43 resin model of the #9 Sauber C37 as driven by Marcus Ericsson in the 2018 Abu Dhabi Grand Prix. 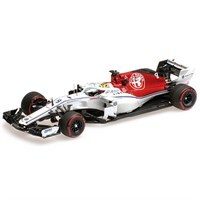 Minichamps 1:43 resin model of the #16 Sauber C37 as driven by Charles Leclerc in the 2018 Abu Dhabi Grand Prix. 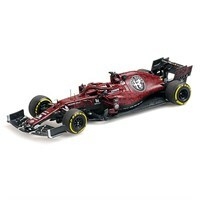 Minichamps 1:43 resin model of the #7 Alfa Romeo C38 as driven by Kimi Raikkonen in the 2019 Fiorano Test. Minichamps 1:43 resin model of the #9 Sauber C37 as driven by Marcus Ericsson in the 2018 Monaco Grand Prix. Minichamps 1:43 resin model of the #16 Sauber C37 as driven by Charles Leclerc in the 2018 Monaco Grand Prix. Minichamps 1:43 resin model of the #9 Sauber C37 as driven by Marcus Ericsson in the 2018 Azerbaijan Grand Prix. Minichamps 1:43 resin model of the #16 Sauber C37 as driven by Charles Leclerc in the 2018 Azerbaijan Grand Prix. 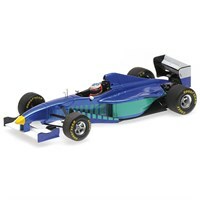 Minichamps 1:43 resin model of the Sauber C16 as driven by Michael Schumacher in the 1997 Fiorano test. Minichamps 1:43 resin model of the #17 Sauber C16 as driven by Nicola Larini in the 1997 Formula One season. 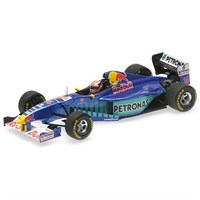 Minichamps 1:43 resin model of the #16 Sauber C16 as driven by Johnny Herbert in the 1997 Formula One season.